It’s true, I love an afternoon in the kitchen, spending hours chopping veggies for a big pot of chili or roasting tomatoes for homemade marinara. But I also love recipes that are a true culinary masterpiece, yet require only a handful of fresh ingredients and half an hour of active cook time. Exhibit A: creamy butternut squash soup. I’ve made this recipe, a classic from the Joy of Cooking cookbook, at least a half dozen times. It never ceases to surprise me. 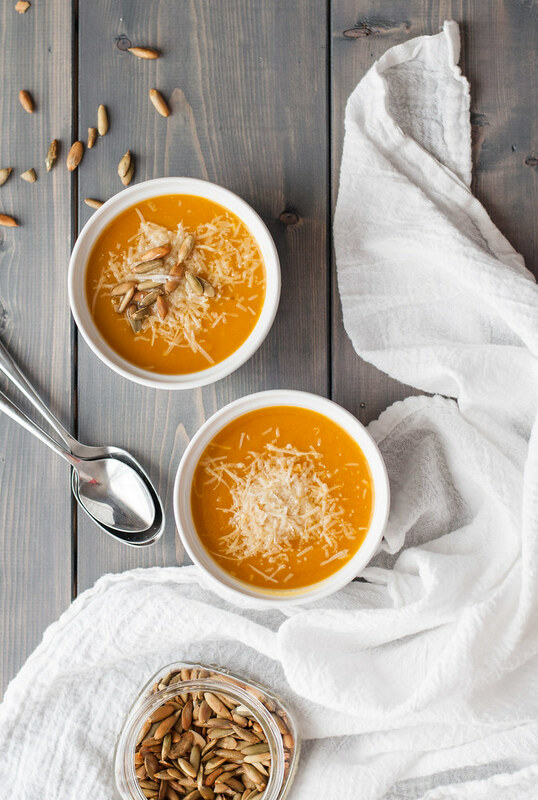 For one, I never liked butternut squash soup before this recipe. I didn’t even really like butternut squash, until I started giving it a second chance post-college. It’s a weird thing for me–I’m not a big fan of fruit in my salads, and that translates to not really liking traditionally savory meals, like lunch and dinner, to be sweet. In other words, I’m a salt fiend. I think that the butternut squash soup recipe my mom and sister raved over for years, to my rolling eyes and looks of disdain, was just too dang sweet, what with a whole lot of cream and super sweet, peak season squash, and not much else. Like I just mentioned, this recipe also boasts a short ingredient list, but the other ingredients are fresh flavor powerhouses that balance the sweetness of squash, rather than intensifying it: leeks. fresh ginger. butter. And that’s about it folks. Throw in some veggie stock, let it simmer away, blend, and you’ve got yourself a beautiful soup that guests will rave over and probably eat way too much of as the first course at Thanksgiving. Even after you make and freeze it, which I’ve done for both Thanksgiving and Christmas (warning: there are spreadsheets), the soup loses little to none of its punch. All you need to do is put it on the stove or, even easier, into the Crock Pot, and you can go about your other preparations for the big holiday. Today is the most blustery, rainy day here in Connecticut. If there’s a day that embodied “fall”, this would be it, as leaves are dropping as fast as the snowflakes will be in a couple months. It’s a day where I would kill for a bowl of butternut squash soup, which holds it’s own as triumphantly for Wednesday night dinner as it does on your biggest holiday of the year. Unfortunately for my appetite, I pulled these photos from almost a year ago (you can tell because the sheet pan in the above photo is now pretty much black, not just nicely seasoned). It’s an essential fall recipe, and I’ve been short on time for cooking and photographing brand new recipes, so what a perfect time to share it. Saturday, I catch a flight to Minnesota, and wedding week for Steve and me begins!!! All the dread and horror of planning a wedding is finally morphing into nonstop excitement and skipping around the house for joy and getting back to my wine consumption (no more sickness or antibiotics!). I’m on such a high that I actually paid over $100 at UPS today to ship a duffel bag to Minnesota so it’s ready when I get there with my favorite sweatpants, and so I don’t have to lug THREE bags around the airport. Because I’m using up my whole carry on for my wedding dress! I’m completely nervous, envisioning TSA picking me and unpacking the whole thing at security, or getting the tiniest plane ever and having to throw a fit because I’m not getting on that plane without my dress, I don’t care if they’re planeside checking it. Breathe, Tessa, breathe. I’m in full acknowledgement that some things WILL NOT go according to plan this week, and I’m ready to let them go, so long as those things do not involve my wedding dress or any other damaged luggage. Now taking sanity tips from successfully graduated control-freak brides. In less nervous news, though, I ordered this awesome shirt today. Is this a fashion blog? Heck no. I need all the fashion help I can get to keep me from wearing yoga pants 24/7, and luckily some people are into that kind of thing and even blog and ‘gram about it to make my life easier. Score. NCK is my baby, but pardon me if it feels a little like an abandoned child for the next couple weeks. I will miss thrice weekly recipes and every day cooking, but I’m ready to immerse myself fully in wedding festivities and enjoy a much needed couple weeks where my mind gets a little break from blog things. Make sure you stay in the loop on a few wedding moments and lots of restaurant food by following along with me on Twitter and Instagram (and sometimes Facebook, when I remember)! 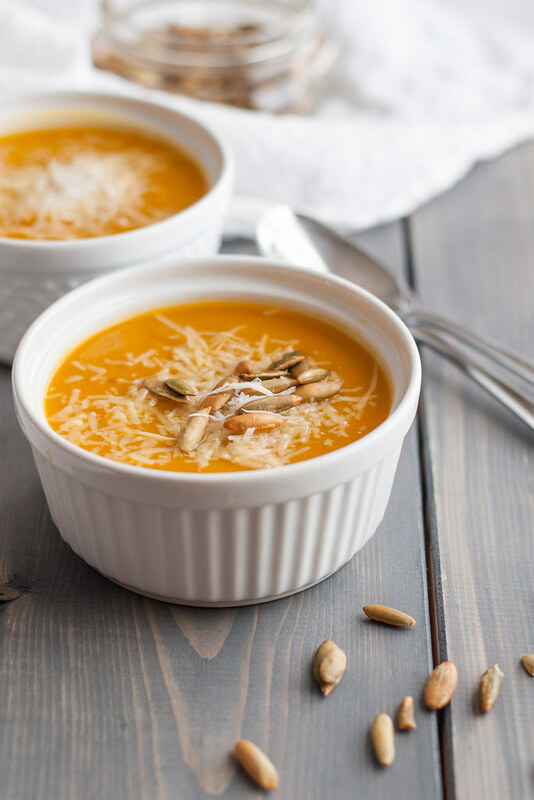 You can fool anyone into thinking this silky smooth squash soup contains cream, thanks to a touch of butter, in season squash, and a few key flavor boosters. Preheat oven to 375 (F). 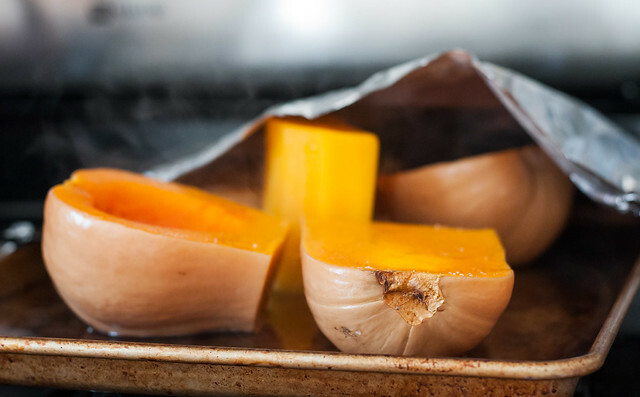 Place squash cut side up on a rimmed baking sheet, add ¼" water to the pan, and cover tightly with foil. Carefully transfer to the oven and bake 35 to 45 minutes, until tender when pierced with a skewer or paring knife. Uncover and allow to cool slightly, then use a large spoon to scrape flesh out of skin and into a bowl or onto the drained pan. Melt butter in a medium Dutch oven over moderate heat. Add leeks and ginger, and cook until softened, about 5 to 10 minutes. Keep the heat low enough that the leeks don't brown. 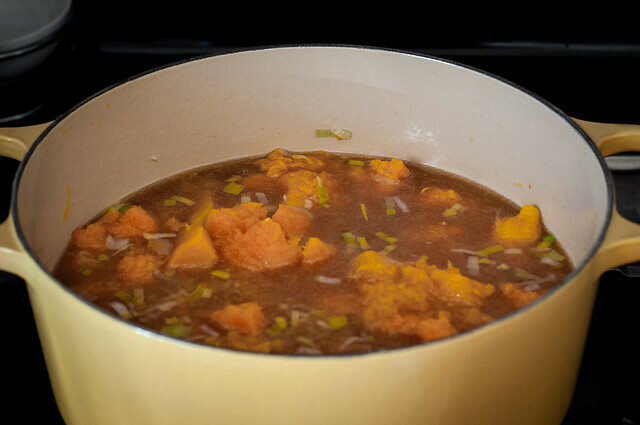 Add roasted squash and 4 cups of the stock, bring briefly to a boil, then reduce heat and simmer 20 minutes. 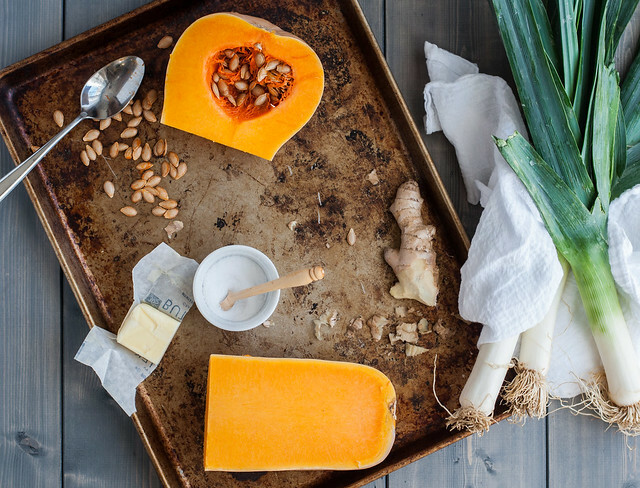 As it simmers, break up squash with a wooden spoon. 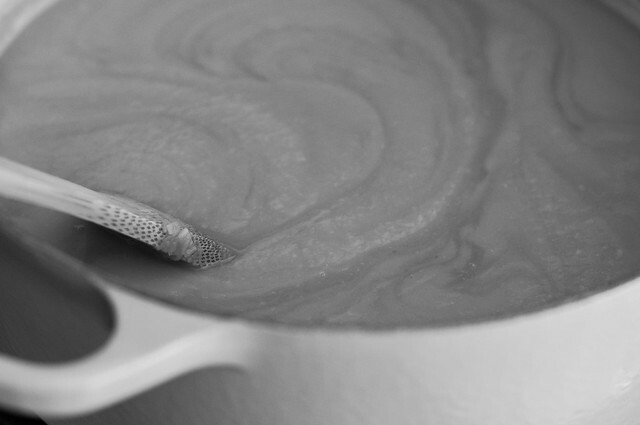 Turn off heat and cool for a few minutes, then blend with an immersion blender, or carefully transfer to a standing blender and puree in two batches until smooth. In the pot, over low heat, stir in remaining 2 cups stock, then season to taste with salt (start with 1½ teaspoons) and pepper. Serve with grated parmesan, pumpkin seeds, and more pepper. Soup is gluten free. To make it vegan, substitute vegetable or olive oil for butter, omit parmesan cheese garnish, and top with fresh herbs or smoked paprika. This is a great soup to make in bulk in advance for Thanksgiving or the winter holidays. Despite the lack of dairy, it freezes well. Thaw and reheat on the stove or in a low crockpot (to save stovetop real estate!). Note: This page contains affiliate links. 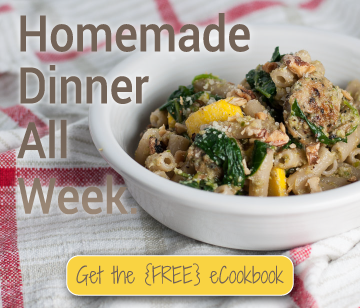 Affiliate links (to products I recommend, on Amazon) offset my ingredient and website maintenance costs, so I can keep bringing you classic recipes like this one. Thanks for shopping! I am always on the look out for a good soup recipe and this one will definitely be added to the list. With the weather finally changing around here to be rainy and cold soups are the way to go right now in my house.